This weekend, more than 4,000 Marines and sailors on the East Coast are grabbing some last-minute liberty before they leave home for a scheduled deployment overseas. The 24th Marine Expeditionary Unit and its 2,300 Marines will depart Camp Lejeune, N.C. on Monday and head to Norfolk, Va. There, they will board amphibious assault ship Iwo Jima, dock landing ship Gunston Hall and dock transport ship New York, which will be making its maiden operational deployment. 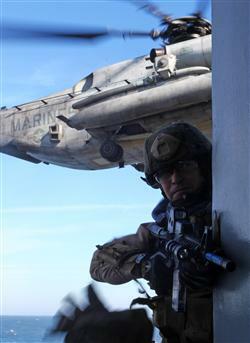 Col. Frank Donovan, a veteran infantry and reconnaissance officer, commands the 24th MEU, which includes Battalion Landing Team 1/2 (1st Battalion, 2nd Marines), Combat Logistics Battalion 24 and Marine Medium Tiltrotor Squadron 261, a reinforced aviation combat element. The 24th MEU is one of seven expeditionary units, which with very rare exception deploy overseas aboard Navy ships as part of an amphibious ready group. Their departure is another in the regular deployment of these expeditionary, sea-going “911” forces trained to respond to crises and contingencies overseas. The MEU/ARG mission as the “theater reserve” for the regional geographic commander makes them the go-to force when you need combat boots, firepower or just a helping hand or two. MEUs have kept busy and operational when they’re out at sea, like taking down pirates that hijack ships (as the 15th MEU did) or supporting spec-ops forces to rescue hostages (13th MEU), helping victims of earthquakes or natural disasters (24th MEU in Haiti) or striking at targets to protect civilians (26th MEU’s jets in Libya).